Tourists taking pictures of them. Asking us to take pictures for them – and with us, for good luck! cowering down in the shade of the temple. Every minute or so a worshipper steps up to ring that bell. 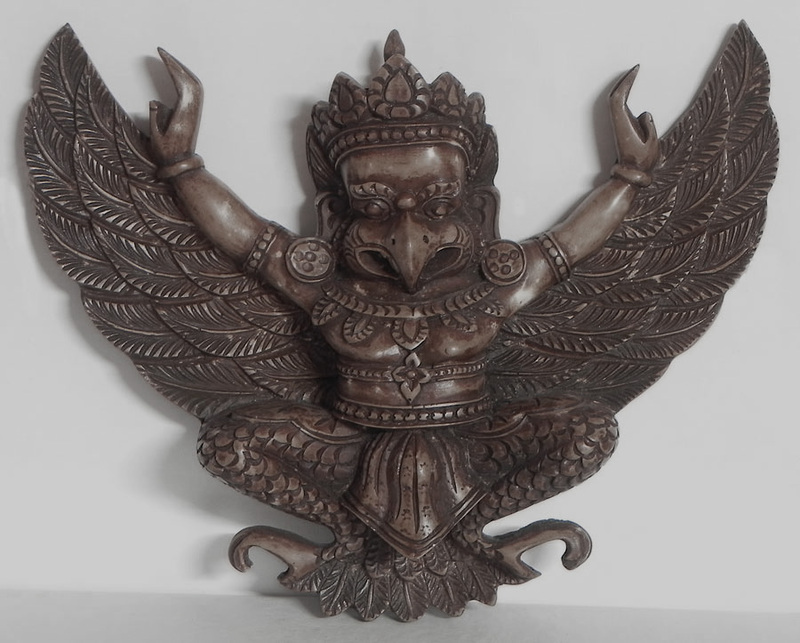 For good luck and for Blessings to be bestowed. Loud noise next to delicate ears created to hear the steps of the Wolf in soft grass…. 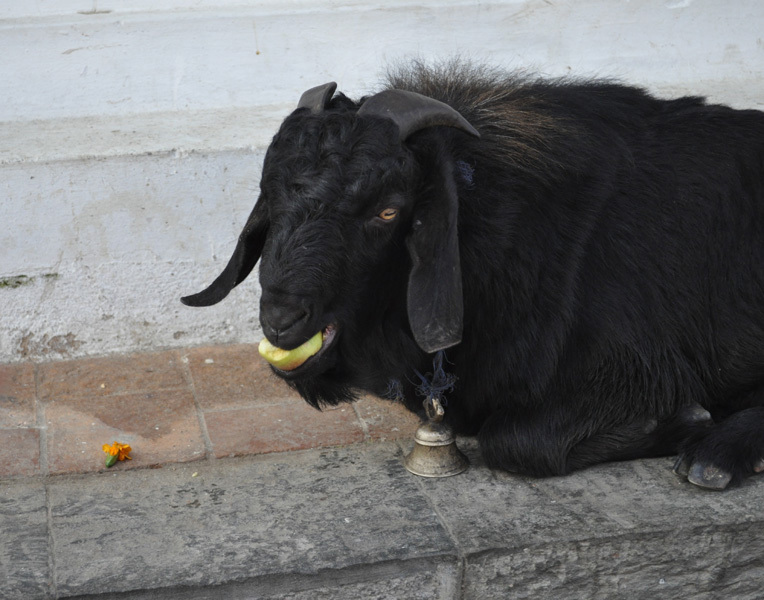 I step up and in “Animal speak” = picture language ask the Billy Goat if I may ring its Bell. He decisively turns its head away from me towards the wall. Seconds later a devotee steps up, grabs the bell and rings it loudly. “You are the ONLY ONE that EVER asked!” he pictured! On time less in its life, that he is having to hear the noise ringing through his body. ….. I do understand that- completely! But he is alive! Not like all the thousands of Goats, Bullocks and Chickens sacrificed during the ongoing Dashain festival. He will live out his days like this, here….. with the bell….. I go over and pick it up. A Gift from a Tree Sister – not honoured. A gift for the Billy Goat. He looks up at me, as I lay the treat before him. He delicately nibbles his prize. It was supposed to be a wonderful, eventful day. 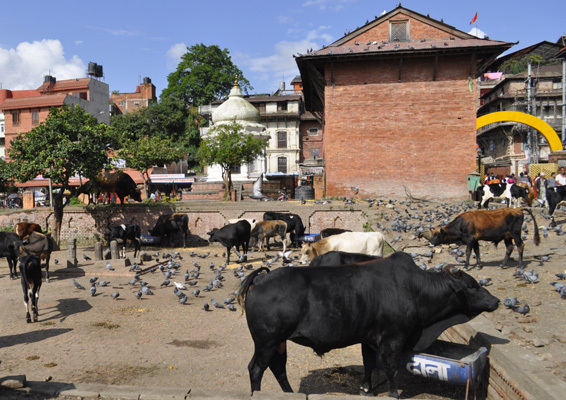 We were going to visit the temple complex of Pashupatinath, the lord of the Animals! Konni, his very best long time school friend had died of cancer. OK, we had been a little worried about him: Earlier in the year, on his annual visit to his mom in Germany, Peter had spend a couple of days with Konni, hiking, relaxing at his cottage in the country side, making delicious food, celebrating a big birthday get together….. But since then nobody had heard from him – Neither Peter, nor the other close classmates. E- mails, phone calls and letters were unanswered. …. On more than one occasion he had stated, that he KNEW, that at some point lung cancer would catch up with him. It had been his wish – not to involve his friends – and his sister obliged….. Still we were upset and distraught….. Even worse, we could not grieve – right now! 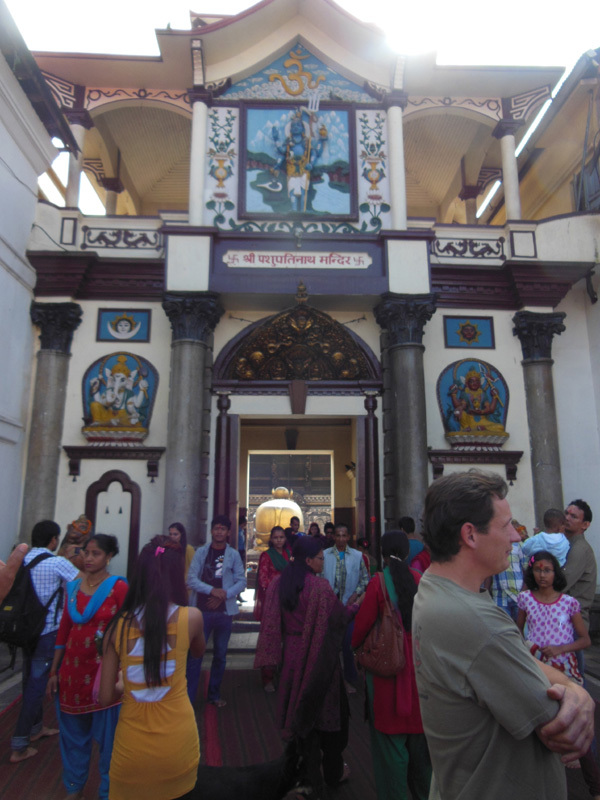 We were in Nepal, with a group of fellow seekers and there was a program to be followed. 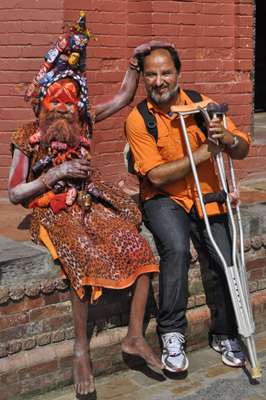 We talked to Bhola, if he could help us, have a small ritual for Konni – and to help us feel a little better. “Later today” was the answer. 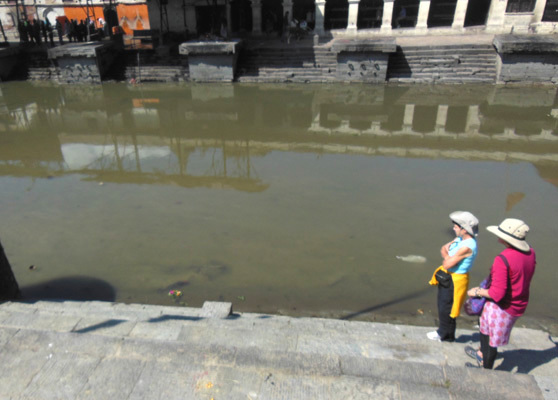 Later that day, after our visit at Pashupatinath we went over to the ghats, the cremation site by the Bagmati River. Across the River there were several rituals in progress. 2 pyres had almost burned out, one celebration of last respect was just getting under way. The body was laid out on the stacked wood which then was lit. Further on a youth was searching for valuables and ? bones? In the river. 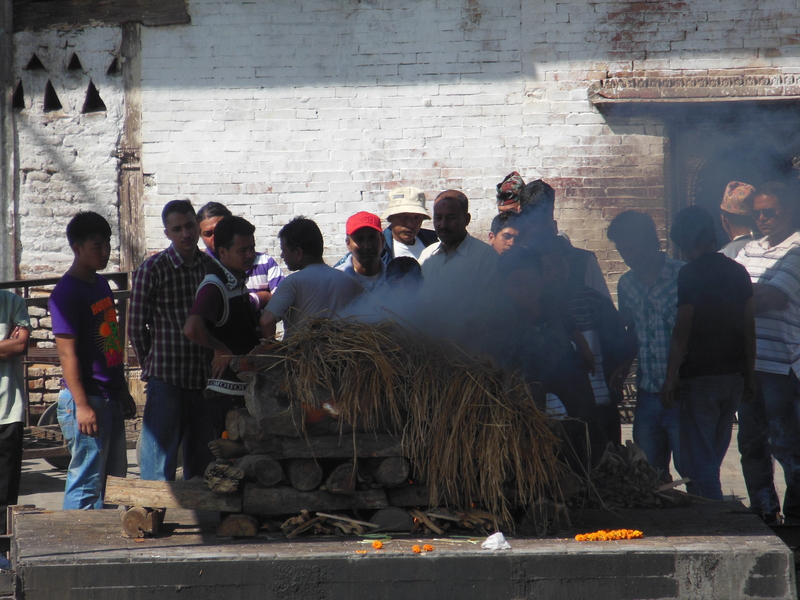 Bhola explained the cremation rites and rituals. 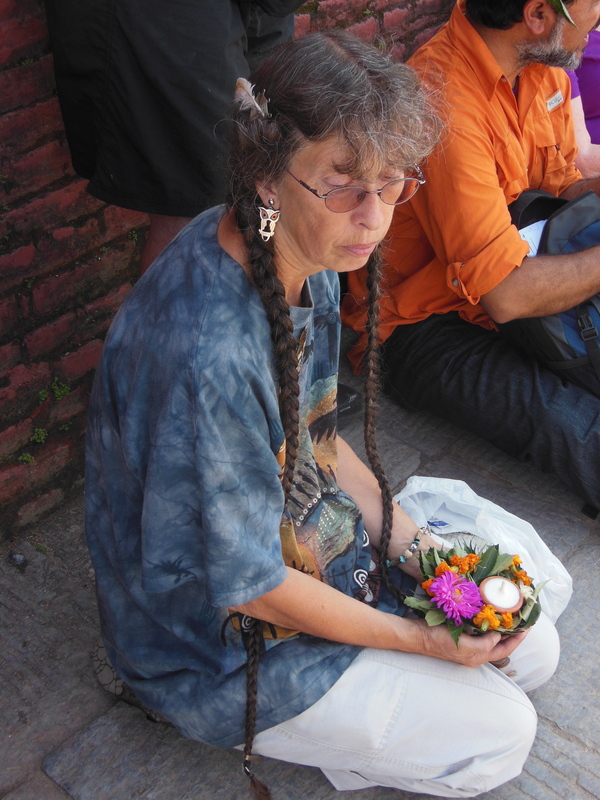 A guide brought a puja, a little leaf dish with flowers and a candle. It was for Peter and me to offer to the River for Konni. I sank all my sadness, my lost sisterly love and my grief into the delicate Beauty in my hands. When it was time to go down to the River, I sensed a heart-felt pain in one of our student friends and asked her, to also come down with us, as I could feel, that she too had suffered a recent loss. 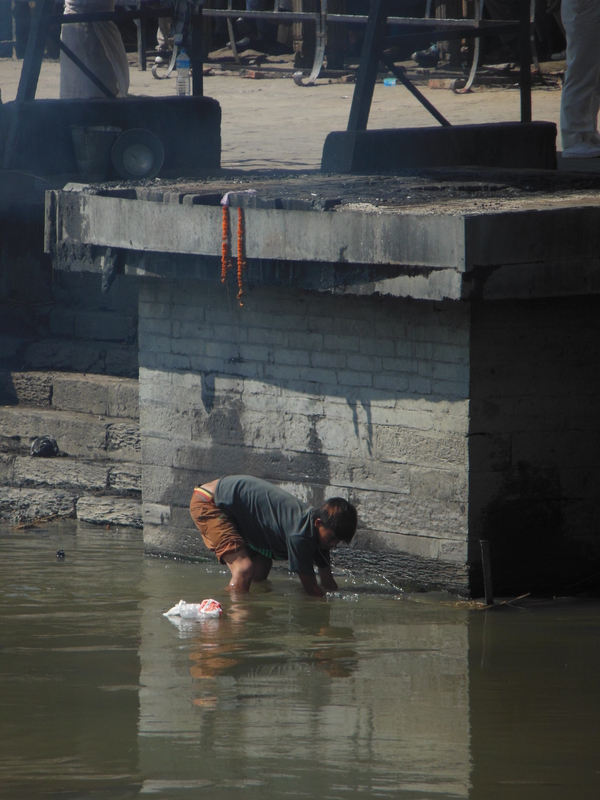 Then we descended to steps to the water’s edge and Peter gave the puja to the River. Blessed Journey to you, Konni. I sang a home going chant……. – to look into the flame. 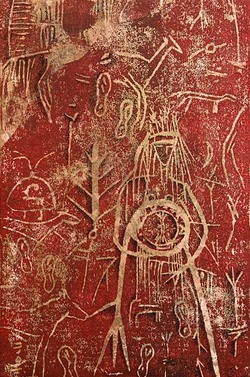 The very air surrounding us and moving the flame is the air our Ancestors were breathing. There is no other. I have no idea, if tears started to flow. I stood at the fire. I stood on my braids, which were sooooo long, they reached the floor. Through them I was rooted to the land of my Ancestors. One of the female Elders, Moon Child’s Auntie, was drumming right behind me. There was a pot of Reindeer stew hanging on the wooden tripod over the flames. I was offered a plate and Es’ lahi fed me with a horn spoon…..
Tears of joy and happiness flowed down my cheeks! 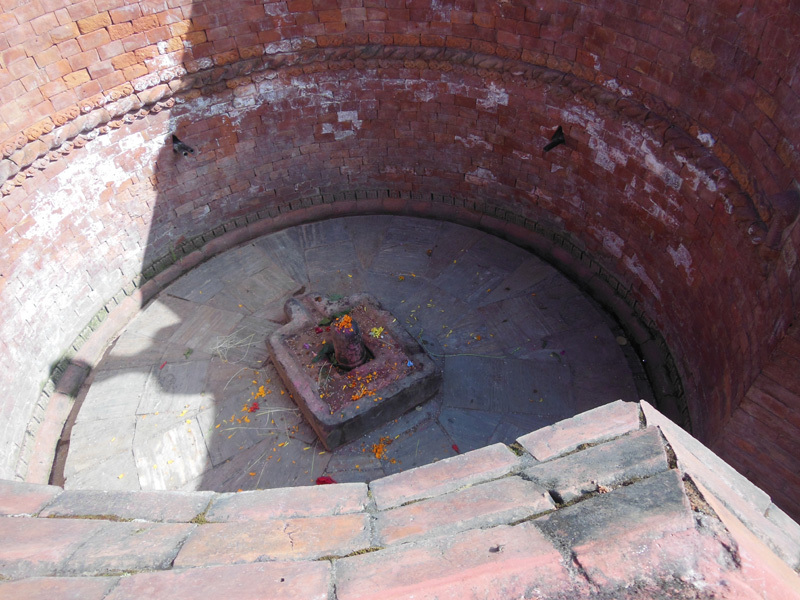 Then at the same time there was movement in the ritual room – and singing drifting in and out of the vision… Bhola and the group…. Thanks for flying with us. 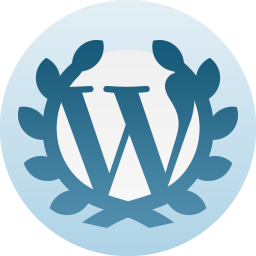 Keep up the good bloging! All the Spirits are here to celebrate! I am so very thankful to all of you , my readers! Thank all you for that! 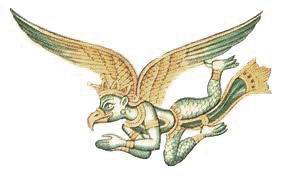 On one of our last days in Nepal Bhola wants us to experience what it is like to soar through the air like Garuda, the mystical Bird of the North and magical vehicle of Vishnu. For this exercise we are to partner up with someone other than our life partner, arrange 2 chairs in such a way, that one person, being Garuda, is leaning far forward over the back rest of the chair in an angle while the other person being the journeyer, sits on another chair but leans way back so as to come to lay on top of Garuda’s back. I am supposed to soar here, but that is all I can think….. 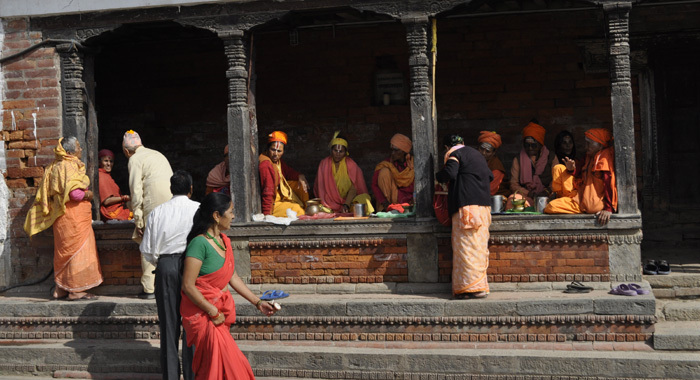 Normally I can journey in any situation; full stomach, empty one, on the floor, standing up, during ritual… never mind…. But always my concern for others comes FIRST! But here I have to cut it out!!! I see Lira sitting on the floor. 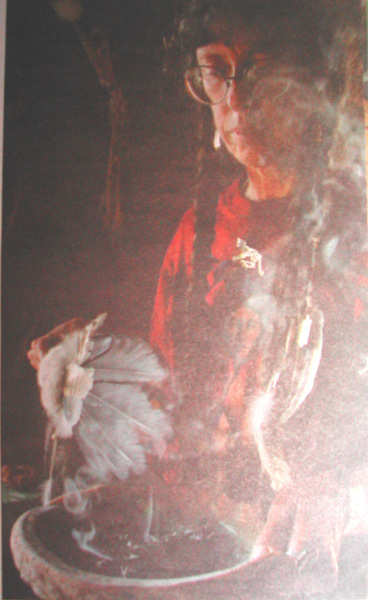 But she has no feathers – not a one! She looks like a freshly plucked Chicken – and she is all grayish brown – no colour…. ….look into the foggy grey sandstorm sky through which Devi, now a Laaaarge flat-beaked Chicken with remarkable looooong feathers is flying. Breath in the sand that poor Devi/Garuda is breathing out. It turns to greenish golden fields far below. That’s better! See, what Devi sees…… Oh, how beautiful….. and private…..
Devi is still alive and well and, it seems to be, so am I…. I lean far forward on the chair and Devi lays back on my back. As the drum starts I spread my wings. I know, I am carrying a golden castle draped with lots of long silk scarves and wish I could find the colours. Again everything is just monochromatic greyish brown and cartoon-like. I have a broken vertebra, that never quite healed and since a few years is dancing with arthritis….. The pain sears into my legs, which twitch and one goes numb…..
“Come on, be a goooood Garuda for Devi!” it is just 10 minutes….. The drum beat is not enough for me to maintain the trance. I need a better vehicle to push me through the pain. I will do, what I have always done….. ride away on the pain…. …. in the dentist’s office, when I can not have the freezing….. 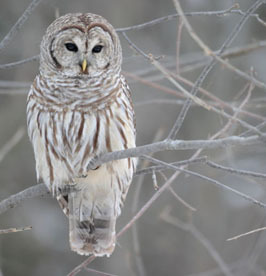 Soar above it, with Huuuuuge wings of a white feathered Owl….. The feathers change back to monochromatic grey/ brown…… but then Lira, now again fully feathered, lands on my Garuda back behind Devi and digs her sharp claws into my Garuda back. Searing pain!!!! It shoots up like molten lava, spews up into my Garuda head – and turns the scenery below me and the segment of my right Garuda wing, that I can see, into a fantastic kaleidoscope of vibrant succulent colours. A red golden sun glows above us,and alights the green mountainous valleys below…..
As the drum fades away the pain intensifies and the scene turns back to monochromatic greyish brown. He told me, that he and his partner M. also only experienced discomfort during this exercise and had no benefits other than quietly enduring it and waiting until it was over. That is often the problem in workshops; People do not share, if/ when something does not work for them – because participants do not want to be the “odd person out” and it is seen as criticizing or dis-respecting the teacher…….